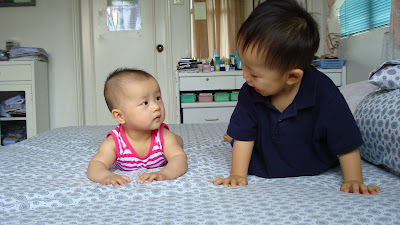 Ethan and Talia's World: Cousins! Aunty Ruth visited Singapore for the first time with Josie last week and although Ethan took a while to warm up to Aunty Ruth and his new cousin (now 6 months), they soon became good mates with Ethan imitating the sounds Josie was making and joining her in crawling around! We're glad he got on well with her and he sure looks like he will be a good big brother to his new sister when she comes in a couple of months!